I don't normally care about commencements. I went to my undergraduate ceremony, on a cool and overcast Sunday, sitting in the giant crowd on the Lawn, but preferred the classics department's graduation afterwards, where I received my actual diploma and they plied us with food and wine. I skipped ECU's 2002 commencement but did attend the anthropology department's more intimate ceremony to get my first MA (and a department mug that I still have). 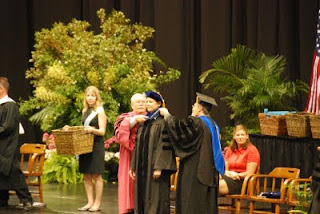 And I also skipped UNC's 2005 commencement but opted to go to the classics department's ceremony to get recognized for that MA (and because they bestowed actual laurel wreaths on the graduates). But seeing as this is my last graduation, I figured I'd participate in most of the hoopla. 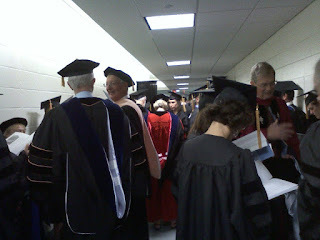 The dean of the graduate school mentioned that, traditionally, professors used to teach wearing full academic dress. When a professor gave a particularly good lecture, students would toss coins into their hoods - that's why the hood has a little pouch at the bottom. I couldn't immediately find a source for this, but my mother decided to put fifty cents in my hood (along with a present I didn't find until the next morning - earrings made of Roman glass presented in a mini skull box!). On Sunday morning, I nearly decided to attend the university-wide zoo of a graduation because E.O. Wilson was giving the commencement address. But I'll watch it this week - and you can too, here. 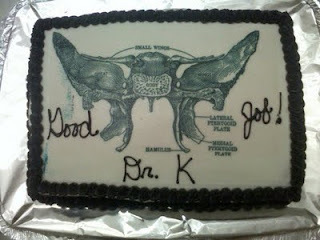 My department's graduation ceremony on Sunday was nice. 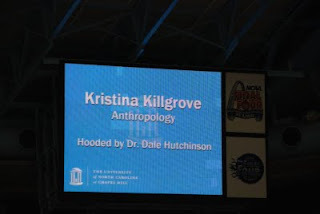 I'd been on the fence about attending, since it's amidst all the insanity that is the full undergraduate commencement, but I found out I was getting an award (for outstanding dissertation in anthropology), so that tipped me into attending. I ran into one of my former Osteology students, and I gave my advisor some really crappy vodka in an awesome decanter. Mmmmm, sphenoid cake. I'm saving the sella turcica for last. Great post, KK. I wrote an email not long after the ceremony, noting that I finally new what Van Gennep meant when noting the liminality of rites of passage. 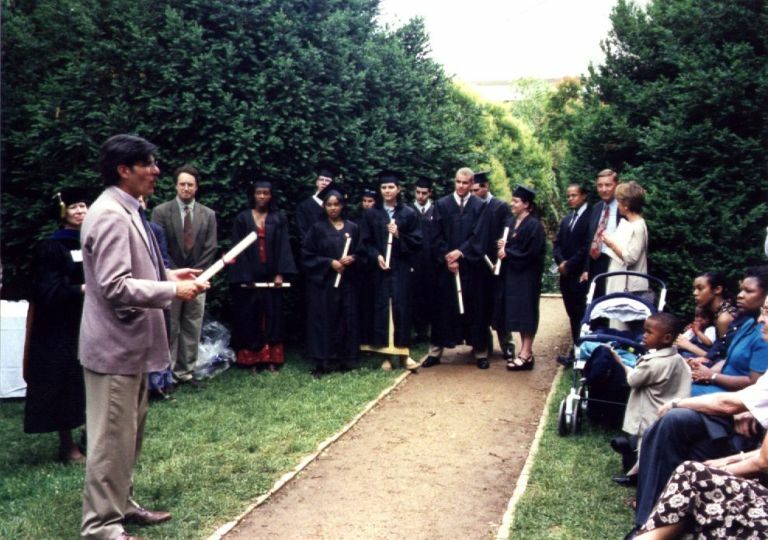 Certainly we needed this ritual in order to usher us into an (often uncertain future), in much the same way that we need dissertation defenses in order to give us some closure on the dissertation. A professor who had graduated from Stanford recently noted to me that they don't have formal defenses there, and that it lieft him with numerous questions and a feeling of incompletion. I think this weekend was a much needed door slam, but one that I enjoyed experiencing with both my friends and family--even if it was super hot. KK, congrats on crossing this final threshold! Rituals are made more important when we choose them—then they become woven into our narratives in a meaningful way. Besides, you worked hard for that funny hat, so you should have at least one opportunity to wear it with pride! Congratulations! for several years I was graduate advisor for our department and got to intone "By the power vested in me by the Regents of the State..."; and I am a sucker for ceremony, so I always go.